Rock ‘N’ Roll Radio are a dance-rock quartet from Seoul, formed of guitarist and vocalist Naehyun Kim, guitarist Jinkyu Kim, bassist Minwoo Lee, and drummer Minkyu Choi. The group have racked up an impressive list of festival appearances, including Green Plugged Festival, Jisan World Rock Festival, and even SXSW (South by Southwest in Texas). Their list of achievements are also worth noting having taken the top spot in December 2013’s Hello Rookie finals; and receiving nominations for Modern Rock Song, and Album, of the Year at the 2014 Korean Music Awards. They may have missed out on both awards (Yoon Young-bae taking them for album and title track Dangerous World) they did snag themselves the Rookie of The Year award, beating fierce competition from artists such as Zion T and Lim Kim. We spoke to Rock ‘N’ Roll Radio as they prepared to share their sound in gigs across France. How would you describe Rock ‘N’ Roll Radio and your music to anyone unfamiliar with your work? Jinkyu: Our friend Annie from the excellent Seoul indie band Love X Stereo recently described our music as being neo psychedelic disco. We think that’s a good way to describe it! To be more specific, our music is based on rhythmical sounds like disco and also includes psychedelic space and melody lines that have both high and low notes. Oh, and there’s a chorus line too. There are many things to enjoy in our music. Jinkyu: We’ve all be influenced by different bands. Personally, I’ve been inspired by acts like Incognito and Jamiroquai. Naehyun: And David Bowie, Depeche Mode, Mr. Bungle, and Talking Heads have all influenced me. Rock ‘N’ Roll Radio won ‘Rookie of the Year’ at the 2014 Korean Music Awards, an award that came three years after your actual beginnings in music. How did this recognition, even after so long, feel for the group? Naehyun: Although Rock ‘N’ Roll Radio was only three years old when we won the award, all of us had been playing music for 10 years. But before forming Rock ‘N’ Roll Radio, none of us had ever received any kind of recognition for our music. So it meant a lot to us to win. It showed that all the time we devoted to making art was not a waste. Unfortunately our lives haven’t changed that much since winning the award, but I think being recognized by people in the music industry and music critics gives music lovers more of a reason to listen to our music. Minwoo: When we won the prize, I felt like I was finally a real musician. Why did you decide to record your new EP in Paris rather than Korea? Jinkyu: We took our demo songs to Love X Stereo and played them for the group. Then Annie suggested recording the songs while we were in France and having Romain Tranchart from Modjo produce them. She knew him already and had his contact information. Things worked out well schedule wise, so we’re going ahead with it. Gregory Louise from Aloud will also be helping to produce the EP as well. We’ve never worked with a producer before – we self-produced our past material – so we’re interested and excited about working with Romain and Gregory. What have been your favourite, and least favourite, parts of touring? Jinkyu: Some members have said they didn’t like the food when we toured the US last year. I liked being able to see and experience new things while we were there. Going to New York was especially exciting for me. There was so much to see and do there. Minwoo: The travel time was really long. The US is really far from Korea, so the flights for our American tours last year were so long. But touring is always exciting. Getting to play gigs in new places and experience different cultures and meet new people is amazing. What would your dream gig include? And where would it be? Jinkyu: I watched a video from Glastonbury 10 years ago. Ever since then, it’s been my dream to play there. Naehyun: My dream is to tour with David Bowie. I hope this wish comes true before he gets too old! How does performing abroad differ from performing to a home crowd? How do you feel performing to a crowd that doesn’t necessarily know your native language? Jinkyu: The language thing isn’t an issue. I think our music can be enjoyed even if you don’t understand the lyrics. Naehyun: We perform the same regardless of where we are. If we could speak English better that would be helpful, but it’s not an essential part of the gig. If we were to change all our lyrics and sing in English, I think we’d lose some of our uniqueness. But our Korean language and identity may seem fresh to overseas crowds. Is there a track you’re looking forward to playing during your French tour? Jinkyu: I wonder how people will react to “Feel Me,” one of our new songs. Minwoo: I think “Shut Up & Dance” is the song that best represents Rock ‘N’ Roll Radio. I’m really curious to see how people in France react to it. Jinkyu: In addition to acts like EXO and PSY, there are lots of great indie bands playing in Korea. We’re one of those bands. Check us out – we promise you’ll be glad you did! 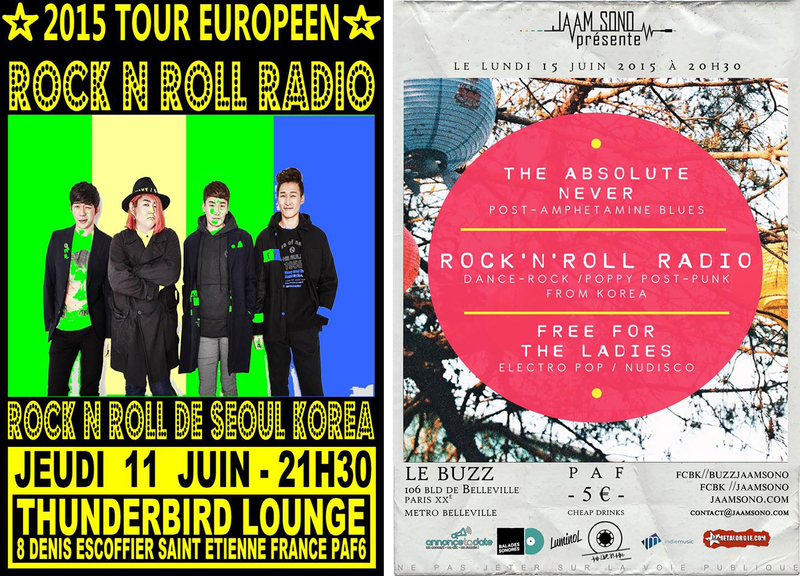 If you’re a French fan of Korean Indie why not catch Rock ‘N’ Roll Radio play one of their remaining shows! They played Midem Festival’s Kpop Night Out showcase in Cannes last night but they still have two shows left. You can catch them on the 11th at Thunderbird Lounge, Saint-Étienne; or on the 15th at Le Buzz, Paris. Not in France? You can still enjoy Rock ‘N’ Roll Radio, the 14 track Deluxe Edition of their Shut Up And Dance album is just £8.99 on iTunes.